Service with Care – Our Caring Service means that we refuse to use the high-pressure sales tactics used by many in this industry. We emphasize communication throughout your project and finish with a final walkthrough to make sure we have met the highest standards. It’s true: we offer premium, caring service from start to finish. Premium Choice Products – We offer Choice Products, insisting on quality products that have industry-best warranties. We also believe it’s important to match the right product with the customer’s needs, not what we want to sell. We serve our customers as their trusted advisors, and have delivered upon this promise hundreds of times. Installation with Craftsmanship – Butler Home Improvement installs everything with Craftsmanship. We treat our highly trained, experienced installers very well. But we also demand more and hold our installers to the highest standards. This is why we can offer TWICE the labor warranty of most home improvement companies, at a similar price point. There used to be a time when businesses cared more about their customers than what is typical now. Customers weren’t just another transaction; instead, businesses worked hard to build a lifetime relationship with people. There were no “press ‘5’ to leave a message and “never get a call back” phone calls. There was pride in doing a job the right way and paying attention to details. 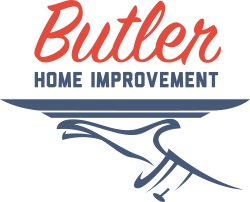 Butler Home Improvement offers White Glove Service to our customers, proudly delivering the best of products, services and installation. Allow the Butler team to show you that old-fashioned service and values combined with the highest standard of products, installation, and home improvement services are still possible today. Whether you’re located in the St Louis or Collinsville areas, treat yourself to White Glove Service with interior and exterior remodeling services from Butler!